Also known as the Trident Class after the missiles they carry, they are the only strategic missile submarines in the US Navy. These sets were taken during San Francisco's annual Fleet Week celebration, October 1995. Photographed on San Francisco Bay, 3/98. Set A was shot when vessel was entering the bay, set B exiting. Only two of these remain, used for special operations. The rest have been decommissioned and scrapped. Taken 9/01 at San Francisco, on her way to decommissioning. She still had her mounting points for the drydock shelter. The latest nuclear submarines in the US Navy, the have been credited with tremendous performance. The Silent Service being what it is, we can only speculate. These views were taken on her christening day, June 24, 1995, by Lester G. Palifka, at GrotonCT. The backbone of the current US attack submarine fleet. The early units are being retired rapidly, but the later units will probably soldier on for many years to come. 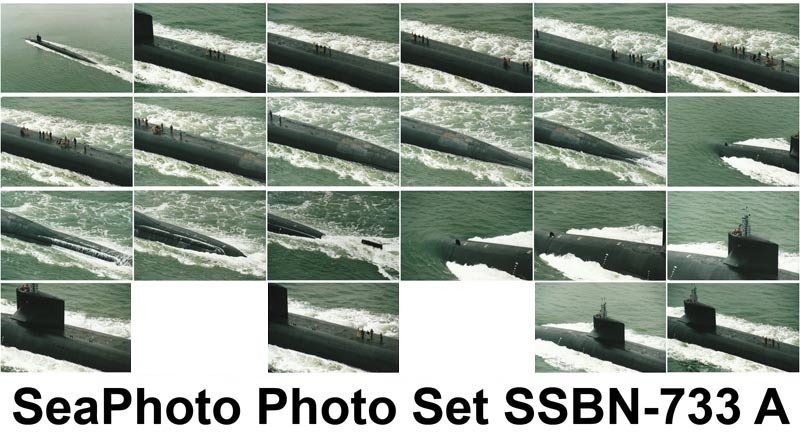 From SSN-751 on, they are known as the improved Los Angeles class, or 688i. These are fitted with vertical tubes for the Tomahawk missile system, improved quieting, and hull mounted dive planes. Mostly gone from the Navy now, this class served for many years during the Cold War. Originally known as the Thresher Class after the ill-fated lead ship of the class. These views were taken 5-19-95 at Groton CT by Ken Hart. 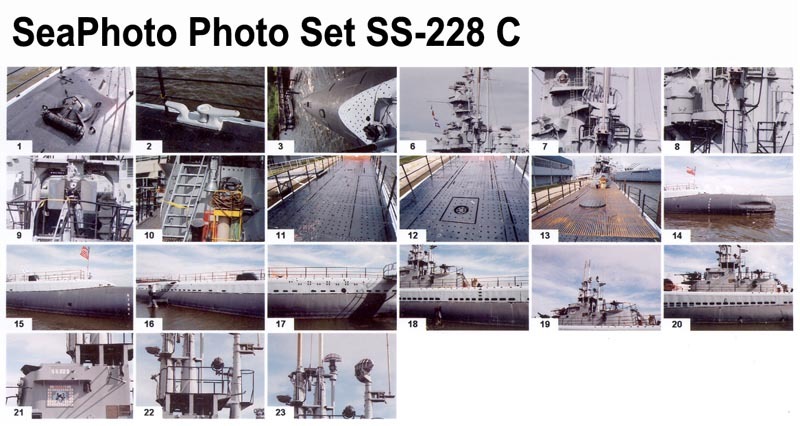 Classed as SSG, these boats carried the Regulas surface to surface cruise missile, and had a large hanger installed on the fosc'l to house this large system. The Growler was photographed 8/94 at New York City, where she is part of the Intrepid museum. The ultimate US Diesel Submarine, they featured the sleek hull design introduced with the Albacore, They have been decommissioned, leaving the fleet with only Nuclear Attack Submarines. Photographed at Portsmouth, NH where she is on display as a museum vessel. Improved over the previous Balao class, able to dive deeper, they were built in the years of the Second World War. All were converted to carry snorkels, and some were rebuilt to GUPPY or FRAM II GUPPY specifications. This class formed the backbone of the US submarine fleet during World War II, built in large numbers. They are a improved version of the previous Gato class, able to dive deeper due to the use of higher tensile strength steel. Another vessel at the Patriot's Point collection, the Clamagore represents the evolution of the Fleet Submarine after the war. Lessons learned from US experience were combined with technical details gleaned from captured German equipment and resulted in the "GUPPY" (Greater Underwater Propulsive Power) conversions. The Clamagore is an example of the GUPPY II type. Taken 9/93 at Charleston. This submarine was featured in the recent movie "Up Periscope" SeaPhoto was there, taking these exclusive overhead views as the Pampanito was towed out for filming. Other views were taken on various dates at Pier 45, San Francisco, where she is displayed as a museum. Pampanito being towed under the Golden Gate Bridge for filming "Up Periscope"
The first of the wartime classes, they suffered tremendous losses during the war, 19 out of 77 total boats built. Taken 9-95 at Galveston TX. The Cavalla is an example of a Type II SSK conversion, with blunt nose and tall sail. Another SSK conversion, they are similar to GUPPY submarines but with a slightly different sail. Photographed 7/94 at Buffalo NY where she is a memorial boat. Built as emergency rescue vehicle in case of a submarine accident. One of the stars of the movie "Hunt for Red October! Mystic is an unofficial name. Photographed 4/00 in San Diego by W. Michael Young, while onboard the Kellie Chouest. Midget Submarines at Groton CT. If you came here from another website, just use your browser's back button to return.